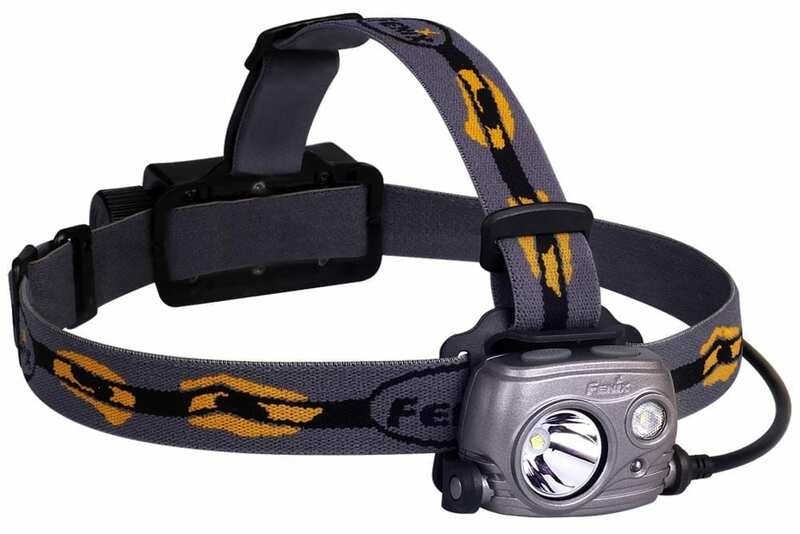 The Fenix HP25R Headlamp is the new standard in rechargeable headlamps. Offering nine modes between a neutral white floodlight, spotlight and red light, this headlamp will easily meet any need while hiking, camping, search and rescue and even cave exploration. The battery level indicator will let you know when it’s time to recharge via the micro-USB cable from any USB power source when the included 18650 Li-ion battery is used. Press and hold the for 0.5 seconds to turn ON/OFF the spotlight. Single-click this button to cycle the spotlight through Low→Mid→High→Turbo. Press and hold the for 0.5 seconds to turn ON/OFF the floodlight. Single-click this button to cycle the floodlight through Eco→Low→Mid→High. The headlamp automatically remembers the last brightness level used in the Spotlight and Floodlight mode, the next time it is turned on, it will recall the previously used brightness level. With the lamp off, single-click the , the lamp will cycle through Red Eco→Red Flash→OFF. With the lamp off, single-click the to activate the battery level indicator, and it will last three seconds. Note: With the light on, if the Red light flashes automatically, it indicates that the battery power is critical, please replace the battery or recharge the lamp soon as possible. Uncover the USB cap, then plug the Micro-USB port of the charging cable into the USB power supplier. The indicator light goes red when in charging process. The indicator turns green when charging is completely done. Pluck the charging cable and then plug the USB cap covered. Note: The charging function only works on 18650 Li-ion batteries. The headlamp will accumulate a lot of heat when it is working at high output levels. To avoid high temperature of lamp surface. When the lamp is overheated up to 65℃ or above, the lamp will automatically adjust the output to prevent the lamp from overheating. When the temperature reduces, the output will return back to previously used output level. During this process, if full-power working is needed, please click the corresponding switch once again. Unscrew the tail cap to insert the battery with the anode side (+) towards the lamp head, and then screw the tail cap. Attach the headband to the headlamp as shown by first sliding the band down to the bottom of the slots, then hook the top edge under the top slot. Warning: 18650 Li-ion batteries are power cells designed for commercial applications and must be treated with caution and handled with care. Quality batteries with circuit protection will reduce the potential risk for combustion or explosion but cell damage or short circuiting are potential risks the user assumes. Excellent quality Fenix Li-ion batteries are strongly recommended for this high-power lamp. Well let me start by saying I love this light. 99% if it anyway. I am a fenix fan have a PD35 and now this beast. I use my HP25R five nights a week on the RailRoad. My only complaint is the cradle that the light housing sits in is made of plastic. I’ve dropped it off my head and it had broken. Because I wear it 12hrs a night lol. Fenix finally took care of me and got me a replacement but if you get the wrong person in the warranty department you’re screwed. So in closing I want to give a big shoutout to Cody who works in the Arkansas warranty department for taking such good care of me. And I would also like to see a solution to this issue. Thanks for the killer products. This light is everything it says it is. I love that I don’t have to attach the battery pac to my waist belt. This light is bright, comfortable to wear, and easy to use. Exceptional battery life. I beat the hell out of this thing and it still shines on. The only complaint I have is that everyone asks to borrow it. Works great in a dark and dirty area. Charge lasts a long time. Comfortable to wear. Good strap adjustments. Does what I need in a headlamp. liked the rechargeable feature. NOT SALT WATER WORTHY… live in hawaii took the light fishing for menpachi on its maiden voyage and it worked awesome for about 6 hours using it sparingly so not to use the battery life and it quit working… flickered for a moment then got hot and quit working completely..
Hi Dustin – it shouldn’t quit working like that. I will have our warranty department reach out to you via email and help you out with that. Hasn’t been field tested yet. Good construction and finish. Very handy bit of kit – use mine all the time. Great for hunting at night and picking up the reflection from deer eyes in the forest. Then can also use work light for working under vehicles in poorlight and around camp. The top output is high for such a small light so aluminum heatsink case can become a tad warm after an hour of constant use. You will also need a few spare rechargeable batteries in your pocket if walking around night hunting for a long period. The versatility of this light is amazing. With red lighting, I use it for night sailing frequently, to preserve my night vision, the flood is great for general close quarters work, and the spotlight is off the charts. I have only used this a few times but I am already impressed. I will be replacing all my climbing and mountaineering lights with this one. This headlamp is very heavy! Love it!! GREAT headlamp! Amazing light, easy to operate!! Not too heavy! Thanks Fenix! you did it again! Cycling/hiking all types of environments this light is awesome. Very well balanced. Head band easily adjustable to bare head, capped head or helmeted head and the adjustable angle light stays put. Floodlight great for camp site or hvy night traffic areas keeping the 4 wheeled murderists on their toes. High level not recommended for city night biking, you’ll have the motorists covering their eyes because they’re temporarily blinded even from just the side wash of the light beam. I wear this in any climate condition. From clear nights, pelting rain storms to 5-15F in Sierra Nevada blowing snow storms. Depending upon the ambient lighting conditions the multiple output levels and arcs work extremely well. Everything from cycling 100 miles or hiking all night you won’t be disappointed. High output level for technical mountain biking at night and lowest level for long treks on your basic roadways or trails. High level is as good as any common modern car headlight. You can see the color of objects easily at 200ft +. Pretty much way overkill in all but the most technical hiking/biking conditions where flailing = death drop. Amazing headlamp. I have been buying the latest black diamond storm for the past 5 years. They have been increasing the lumens a tiny bit each time but its NOTHING compared to the 25r. I swear they don’t get as bright the longer you own them. I wanted a headlamp that i can go on hikes with my dogs on my local trails and that i can recharge. I got tired of replacing 4 AAA batteries in the storms. With the HP25R i can use all the power i want and just recharge it when i get home. The battery last a long time. The 2nd and 3rd brightest while using the spot is plenty of light. I took off the top band because you don’t need it. I am going to hike the PCT trail in 2 months and am seriously considering taking this lamp vs a lighter lamp. I might get the HL26R lamp Fenix just came out with and take that. I would like to see Fenix let us use the 350lum spot and 350lum flood at the same time. I also use them headlamp for mountain biking and it works great. I got this lamp because of the flood and its awesome. Hope you enjoy it as much as I do. As a fan of the original HP25 and of 18650 power, I was excited to see this model come out, and now that I’ve received it, I’m not disappointed. Pros: extremely solid construction; very even flood illumination; extremely powerful spot (about 50% wider than HP25 too). Only con is that I can’t use both flood and spot at the same time (sometimes that’s what I want). Partly offset by the wider spot though. Great light!